The Cruise Center Beach can get quite busy when a ship is in port. Although not quite as nice as Governor’s Beach, this beach offers calm water and white sand. Typically quite busy when a cruise ship is in, the northern end of the beach will be less crowded. The Carnival Freedom moored at the Cruise Center Beach. This beach is also known as SunRay Beach. Found fronting the Cruise Center, this beach sees by far the largest crowds of any beach in the country. The ocean at the Cruise Center Beach is almost always calm and clear, and the majority of the coastline is clean soft sand. There are a few rocky spots, but these are easily avoided. As to be expected, this beach can get quite crowded in the vicinity of the Cruise Center when a ship is present. However, there’s always more space further up the beach to the north. As with all beaches in the Turks and Caicos, access is free. Complimentary beach lounger use is also offered near the Cruise Center for cruise guests. 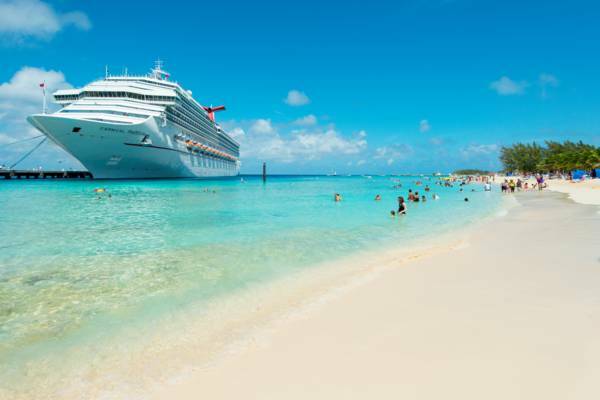 The Cruise Center Beach is located on the leeward side of Grand Turk, so ocean conditions are typically excellent. See Turks and Caicos Weather Forecast. 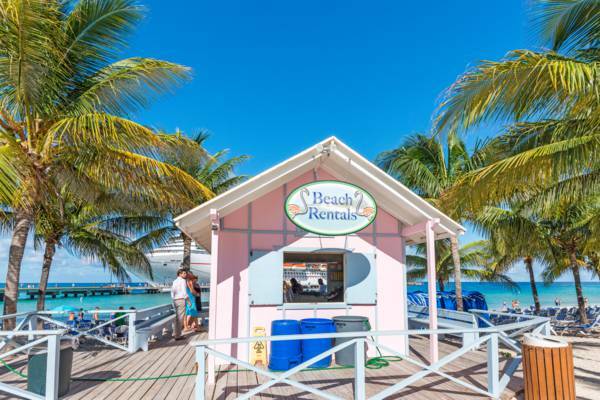 The Beach Rental Shack at the Grand Turk Cruise Center. Snorkel masks, fins, and vests, floats and toys, and covered shade beach cabanas can be rented from the Cruise Center beach rentals shack. The standard beach loungers are free-to-use, although the density of loungers fronting the Cruise Center is quite high. Up the beach to the north, additional loungers can be found fronting Jack's Shack restaurant. This section of the beach tends to be less crowded. The Cruise Center Beach is part of the Columbus Landfall National Park. Snorkelling isn’t great here, but rock and coral patches can be found off the coast both to the north and south of the main pier and are home to small amounts of fish. Simply head south past the smaller Cruise Center shore excursions pier and look for the darker patches of ocean. 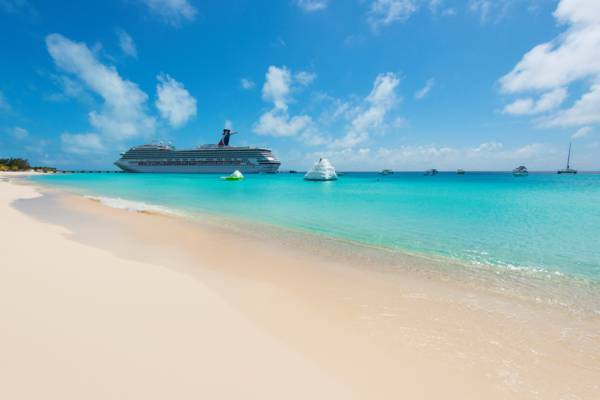 The calm waters of the Cruise Center Beach, Grand Turk. A small reef can be found can be found off the beach half a mile south of the Cruise Center near Boaby Rock Point. When weather conditions are calm, decent snorkelling can be found here. Snorkelling equipment can be hired from the beach rentals stand at the Grand Turk Cruise Center. There are two restaurants within easy walking access of the Cruise Center Beach: Margaritaville, and Jack's Shack. Both establishments serve international favourites and bar food. As is also the case with the Cruise Center itself, the restaurants tend to be quite crowded when a ship is in port. If you plan to rent a car and explore Grand Turk, consider dining at one of the Cockburn Town restaurants if you’re looking for a bit more tranquillity.